Monolithic 3D SRAM project; hairy materials; listening to bacteria. A group of companies have started a research project to propel the development of monolithic 3D chip technology. The research project, called COMPOSE³, involves the ability to stack transistors vertically. Within three years, the group hopes to unveil a proof of concept for building the world’s first 14nm, 3D-stacked SRAM cell based on III-V materials. Coordinated by IBM Research in Zurich, the project also includes STMicroelectronics, CEA-Leti, the Centre National de la Recherche Scientifique, the University of Glasgow, Tyndall National Institute, DTF Technology GmbH, and Fundación IMDEA Materiales. COMPOSE³ is a 4.7 million euro project, with 3.2 million euro funded by the European Union’s Seventh Framework Program (FP7). The project started in January of 2014 and will run for three years. Researchers hope to develop an SRAM cell based on two materials– indium gallium arsenide (InGaAs) and silicon germanium (SiGe). SRAM, an essential circuit component found in processors, is usually built of two different types of transistors, called nFET and pFET. In the proposed project, the nFET will use InGaAs, whereas pFET will use SiGe. As charge carriers can move faster in InGaAs and SiGe than in silicon alone, the transistors can also be operated at a lower voltage, greatly reducing the power consumption of digital circuits. 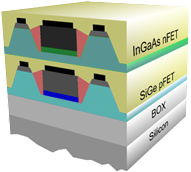 The chemical properties of InGaAs and SiGe also offer the possibility to stack transistors vertically at the nanometer scale, opening new avenues to increase the number of devices per unit area. Still, the challenges associated with this approach are significant. III-V materials are prone to defects. There are issues with low-resistance contacts. And there are thermal management issues during 3D stacking. “This technology will provide a new paradigm shift in density scaling combined with a dramatic increase in the power efficiency of CMOS circuits. Our synergistic approach is based on replacing silicon with high-mobility channel materials such as SiGe and InGaAs,” said Jean Fompeyrine, manager of the Advanced Functional Materials group at IBM Research at Zurich, on IBM’s Web site. The U.S. Department of Energy’s Argonne National Laboratory has devised a new technique to grow tiny “hairy” materials that assemble themselves. 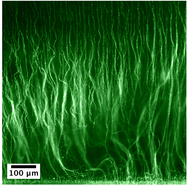 Researchers developed self-assembled tunable networks of microscopic polymer fibers, ranging from “wavy colloidal fur” to interconnected networks. Using a self-assembly process, the networks emerge in an alternating electric field from a non-aqueous suspension of polymeric colloidal particles. One day, these self-assembled tunable materials could be used for electrodes in batteries, organic photovoltaic cells, and microfluidics. In one experiment, researchers used an atomic layer deposition (ALD) tool. The tool deposited a molecule-thick layer of material over a hairy structure. The material was added to a layer of semiconductor material. In doing so, researchers demonstrated that the tunable networks can serve as a template for a transparent conductor. To grow the materials, researchers added an epoxy to a mixture of hardener and solvent inside an electric cell. An alternating current is applied through the cell, enabling the twisting fibers to grow. With the technology, researchers can grow many different shapes, such as short forests of dense straight hairs and long branching strands. “The process is very simple, the materials are cheap and available and they can grow on almost every surface we’ve tried,” said physicist Igor Aronson, on Argonne’s Web site. Columbia University’s Fu Foundation School of Engineering and Applied Science has devised an integrated circuit that can be used to listen to bacteria. The CMOS-based device enables researchers to electrochemically image the signaling molecules from bacteria colonies spatially and temporally. Researchers devised a chip-based electrochemical sensing platform. It included an array of electrodes and parallel potentiostat channels. With the platform, images over a 3.25 × 0.9 mm2 area are captured with a diffusion-limited spatial resolution of 750μm. Researchers were able to detect four distinct redox-active metabolites called phenazines. “This is an exciting new application for CMOS technology that will provide new insights into how biofilms form,” said Lars Dietrich, assistant professor of biological sciences at Columbia University. “Disrupting biofilm formation has important implications in public health in reducing infection rates. “We describe using this chip to ‘listen in’ on conversations taking place in biofilms, but we are also proposing to use it to interrupt these conversations and thereby disrupt the biofilm. In addition to the pure science implications of these studies, a potential application of this would be to integrate such chips into medical devices that are common sites of biofilm formation, such as catheters, and then use the chips to limit bacterial colonization,” he added.